Shauna Hallmark proudly describes herself as a “geek” in school. She knew she wanted to work in the STEM fields. Fast forward, and Hallmark is now the director of Iowa State University’s Institute for Transportation (ISU InTrans). 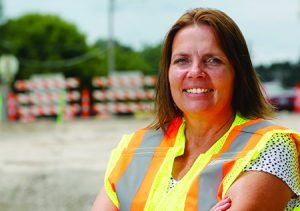 She is a professor of transportation engineering at ISU’s Civil, Construction and Environmental Engineering Department. Not only that, but Hallmark has balanced a successful engineering and academic career with raising a family. Even so, her status as first woman director of a national, multi-million dollar research institute isn’t the first thing on her mind. Hallmark attended Brigham Young University for her bachelor’s degree and then went on to earn her master’s and doctoral degrees from Utah State and Georgia Tech, respectively. In fact, she started her master’s degree with a two-year-old and twin two-month-old infants. After coming to Iowa State in 2000, Hallmark earned tenure by 2006 and became a full professor in 2012. She would go on to earn the InTrans director position in 2014. She has achieved countless awards and honors, including recognition from the Transportation Research Board Executive Committee and the Iowa Governor’s Traffic Safety Bureau. She currently holds the Robert S. and Roxann L. Paulsen Professorship in Civil, Construction and Environmental Engineering. It’s obvious that Hallmark doesn’t back down from a challenge easily. Still, she says one of the greatest strengths of a leader is to know when to compromise. She encourages engineers, both women and men, to find a balance between professional and personal goals. She also has a special message for women engineers. Instead of downplaying abilities, Hallmark wants women to play to their strengths. Want to find more STEM change agents like Shauna Hallmark? Follow us on Facebook, Twitter and LinkedIn (Iowa State University Civil, Construction and Environmental Engineering and ISUConE) for the latest game changers in engineering.